The final stop on the 2019 NMCA Muscle Car Nationals tour is at Lucas Oil Raceway on September 19-22 and it is one event you don't want to miss. It is Indianapolis' biggest street-legal drag race of the year with 4,000hp Pro Modifieds, 275 Radial racing, Chevrolet Performance Challenge Series, and Index competitions. There is also True Street and special FREE entry to the Chevrolet Performance Street Car Challenge and Dodge/Mopar HEMI Shootout (Gen III Hemi only). There is more than just on-track action with Car Show and Manufacturer's Midway. Spectators save 20% with online ordering and Racer/Crew save time with advance ticket sales. Lucas Oil Raceway in Indianapolis, IN hosts the final stop of the 2019 NMCA street racing tour over the weekend of September 19-22, 2019. 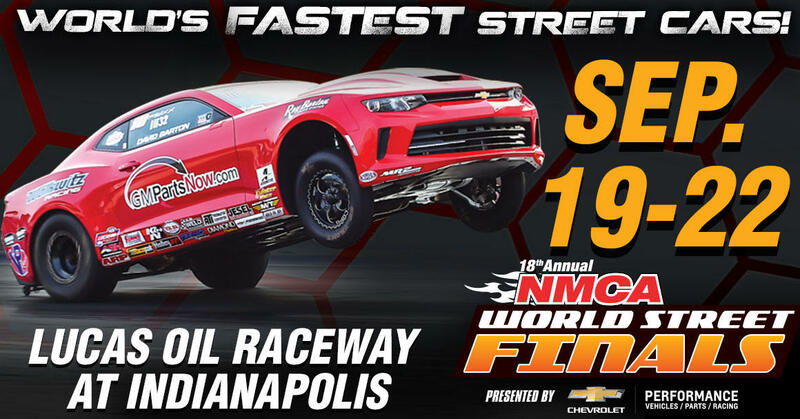 The 18th Annual NMCA World Street Finals includes heads-up drag racing showcasing the wildest nitrous-gulping, turbocharged, and supercharged door-slammers and wild outlaw radial style racing. Also, the regions best Stock and Super Stock racecars return to Lucas Oil Raceway to see who will be crowned the muscle car champion. The massive All-American Car Show, on Saturday and Sunday, features over 100 class awards, from stock to modified, up for grabs over two complete days of judging and fun on Saturday and Sunday! Each event also features a large Manufacturers Midway (Friday through Sunday), Swap Meet and a Burnout Contest. Theres something for everyone at the NMCA Muscle Car Nationals make your plans to attend now! The Chevrolet Performance Challenge Series selected Summit Motorsports Park for its third stop on the four-race circuit, dragging out LS/LT-powered vehicles. Fun, cash and prizes, and a chance for glory headline the Chevrolet Performance Challenge Series. If you have a LS/LT-powered street car, sign-up for a chance to race FREE in the Street Car Challengego to www.NMCAdigital.com/IN for more information. Keep It LegalTrue Street is the answer to legal street racing and it is open to all domestic cars whose owners want to go fast. A 30-mile cruise, on Saturday August 25th, proves the street capabilities while three consecutive passes on the drag strip establish a 3-run average used to rank the competitors. With 8 winning prizes available (15-second, 14-second, 13-second, 12-second, 11-second, 10-second, 9-second, and Overall Winner) True Street officials rank competitors based on performances and rewards them accordingly. For True Street racers who hang around on Sunday, NMCA gives you a free entry into the bracket race! Have a Late-Model Dodge/Chrysler/Jeep vehicle with a HEMI? Want to race it for FREE? Cruise over to www.NMCAdigital.com/IN for more information on how to enter the Mopar / Dodge HEMI Shootout and enjoy a free weekend of racing your modern muscle car! The Aerospace Components Winners Circle hosts its final NMCA party of 2018 at Lucas Oil Raceway as racers hoist the Victor trophy for one last time in 2018.